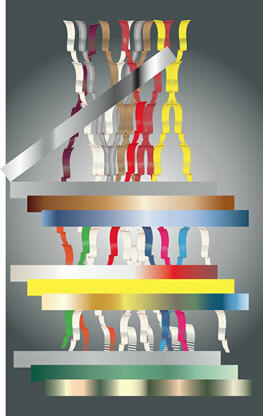 The use of layering is as fundamental to digital imaging as it is to painting itself - with the difference that the virtual layer in Photoshop or Illustrator can be created, resized, reordered and otherwise adjusted in a matter of seconds, allowing for relatively straightforward generation of complex, multi-level graphics. 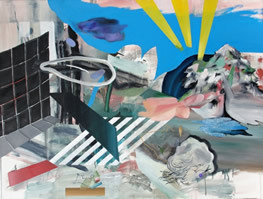 In the last decade or so, growing reference to multiple layering techniques appears to have steadily infiltrated contemporary painting, with recent abstraction in particular revealing logic-bending manipulation of the layering concept. 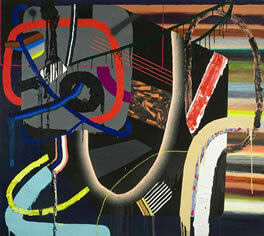 Like Fiona Rae and several other artists featured here, Albert Oehlen's career spans the digital/analogue divide. 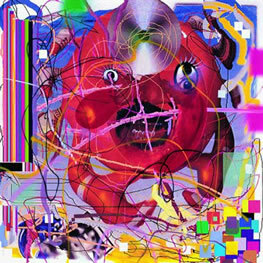 Having established a name for himself in the 1980s with neo-expressionist works such as Mützen (1981, left), Oehlen was one of the first major painters to adopt computer technology, commencing in 1990 with a series of black and white "computer paintings" (above). 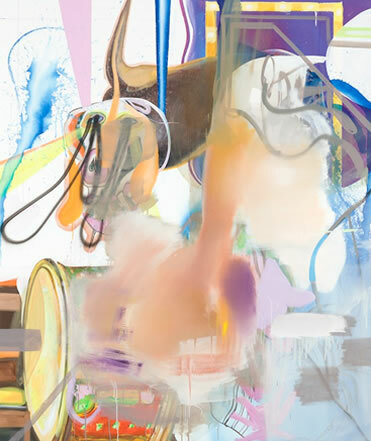 From this point onwards, digital technology radically influenced the direction and appearance of Oehlen's practice, its possibilities referenced in ways ranging from the self-evident to the more subtle. 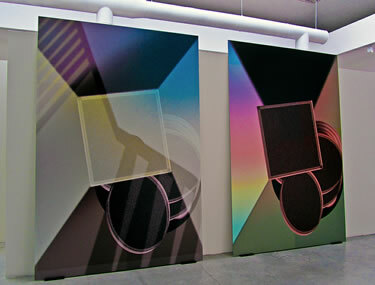 Raucher (1999), for example, (left), is a direct translation into oils of what is clearly a digital source file; other works combine inkjet printing with paint, or even reject paint as a medium altogether. 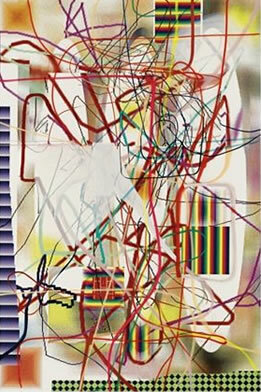 The most profound effect of digitisation on Oehlen's practice, however, lies in an emphasis on the layer. 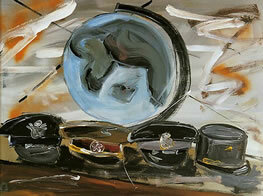 Such stylistic transition can clearly be traced by comparing Oehlen's early, neo-expressionist inflected works and their focus on gestural surface to mounting concerns with multiple strata of superimposed motif. 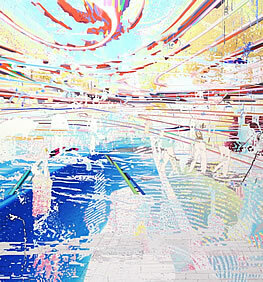 For most younger artists the kind of pictorial space made possible by computer technology is simply a given; yet another visual reference, albeit a highly influential one. 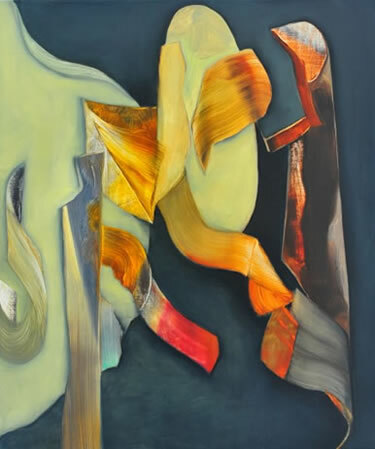 And in many cases, it appears that the concept of the layer has permeated their work to a conspicuous degree, with recent abstraction, in particular, characterised by almost unprecedented degrees of planar complexity. 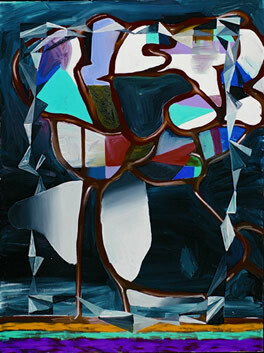 In many such works, paintstrokes and forms intersect, fold around each other and are 'stacked' in ways which, while relatively easy to achieve in software such as Photoshop, require bravura technical skill to actually produce in paint. 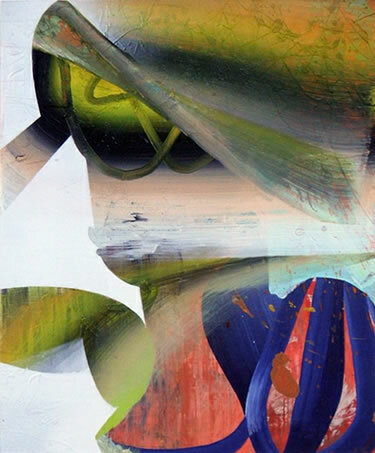 Add to this a marked emphasis on masking to reveal layers within layers, and the influence of digital composition seems to radiate through even the most painterly practices with an as yet unacknowledged force. 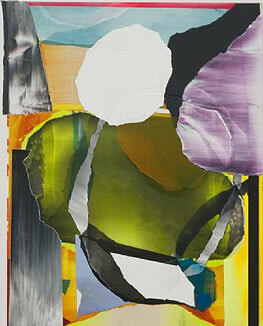 The work of emerging Chicago native Andrew Holmquist displays many of the key attributes we're associating here with an identifiably 'digitised' language of contemporary abstraction: prominent, multi-chromatic brushmarks; clear use of masking effects; and an emphasis on problem-solving in terms of many-layered complexities of composition. 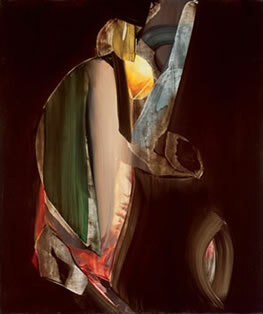 Note how, in the painting above, highly liquid strokes intersect in ways which in fact defy the logic of their apparently spontaneous application. 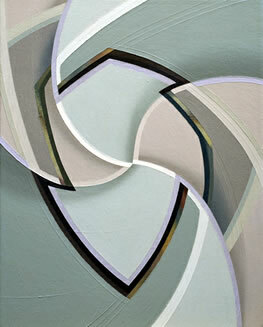 The ribbon-like upright flourish to the right of the canvas, for example, appears to have been executed in one, continuous movement, but is capped with a sequence of three sharp directional 'folds' which are actually impossible to achieve using a single paintstroke: the final, multi-chromatic twist has been added as a later layer. 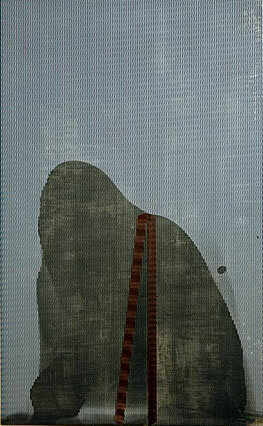 The same line also appears to to wrap under, then around, a staggered grisaille brushmark without any merging of paint: again, an impossibility if we assume - as Holmquist's technique here leads us to believe - that the entire composition was executed in a single session without drying time. 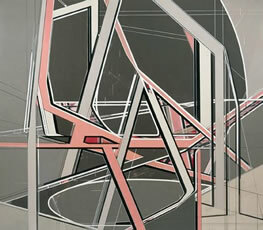 The fluid, directional line so evident in Holmquist's paintwork - as well as that of various contemporaries (below) - emerges as a kind of ruse, provoking the belief that impossible manoeuvres have been performed via single sweeps of the brush rather than as a series of separate layers and infills. 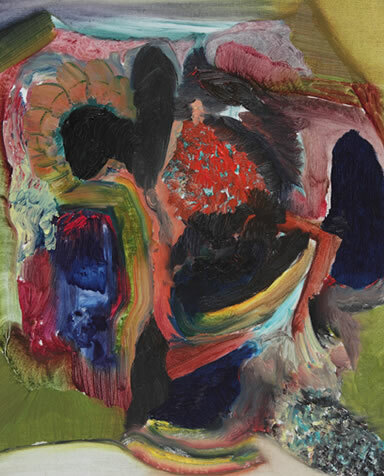 Such gestures appear to owe some debt to the influential work of Bernard Frize, whose canvases employ equally inscrutable choreographies (often created using a team of painters to enable the simultaneous production of marks impossible to achieve by an individual). Yet they are equally, of course, products of exposure to a digitised picture plane in which once-inconceivable complexities of stacking and layering have become commonplace. 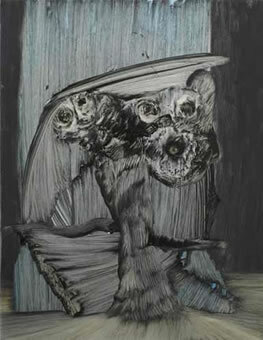 In the other works pictured, apparently overt references to digital editing - such as the hard-edged graphic motifs in Gasp (2011, below) or the complex masks within masks of Gone With The Wind (2012, bottom) - are paired with highly painterly manoeuvre that both refutes and counterpoints an internal rigidity of structure. 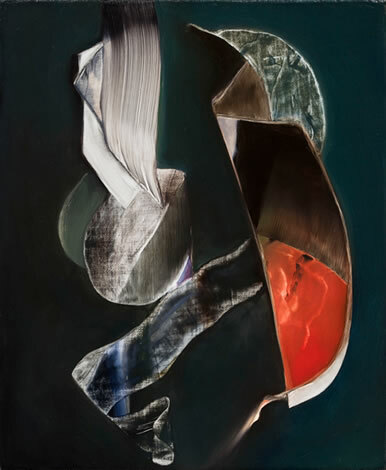 LA artist Lesley Vance's rich, absorbing paintings exemplify the spatially complex, problem-solving abstraction that is increasingly evident in contemporary practice. 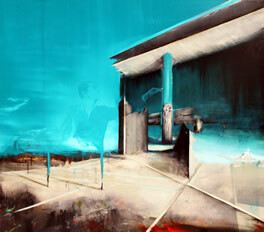 Typified by gestural, fluid paint application (Vance uses both brushes and a palette knife) multiple layers are combined with masking - or an approximation of the technique - to reveal a dense, mille-feuille-like composition. 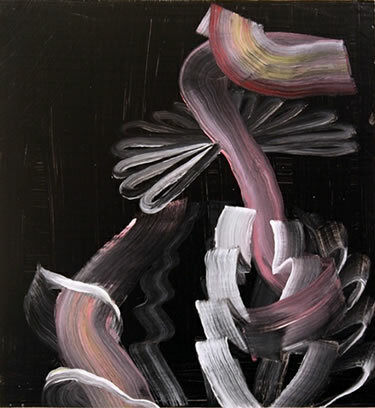 A use of heavily striated brushstrokes or thinned-down paint clearly indicates different directional movement, the complexity of this effect verging on a kind of conundrum due to the apparent overlap of opposing definitions of form and plane. 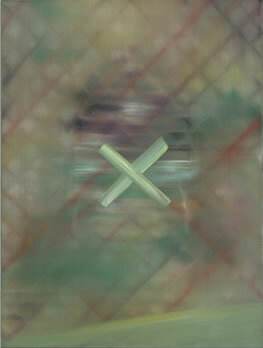 In later works (below), the introduction of drop-shadows adds further implications of cryptic, multi-layered depth. 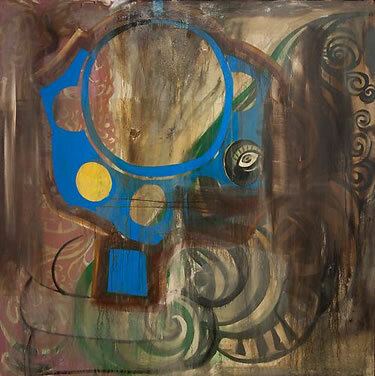 The complex partial abstractions of emerging Polish artist Gregor Gleiwitz could hardly appear more painterly in execution, yet aptly illustrate the extent to which digital procedures have permeated and influenced the vocabulary of today's painters. 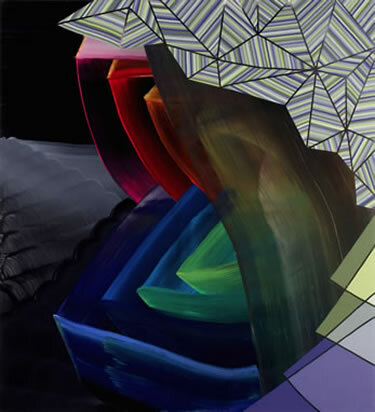 While it's unknown whether Gleiwitz (or indeed Vance, or Holmquist) actually produce preparatory work of any kind in Photoshop, their compositional modelling is conspicuously layer-based, dependent on multiple superimposition and complex interaction between painted strata. 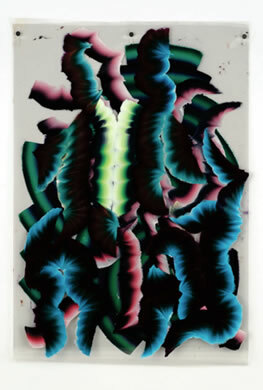 For Gleiwitz, the multi-chromatic or heavily striated brushstroke is an equally important feature of such planar definition, serving to define form in a way that differentiates his own use of the trope from a far more decorative application by artists such as Yago Hortal and Kerstin Brätsch (below). 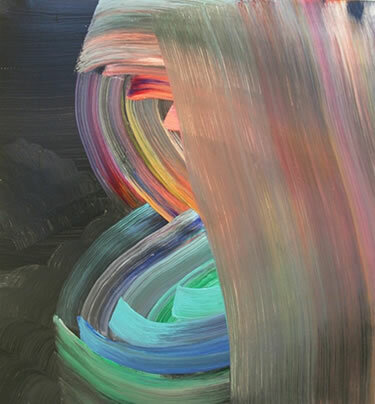 Instead, striations of colour are used to demarcate specific layered planes, the often contradictory direction of (apparently) wet on wet brushwork establishing technical complexities and conundrums such as those employed by Andrew Holmquist or Lesley Vance (above). 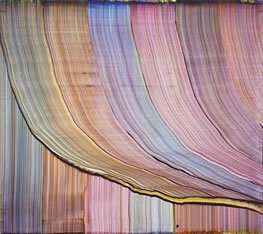 Also like Holmquist, Gleiwitz often employs a kind of 'folded', self-intersecting brushstroke, the movement of which is again made evident through multi-coloured streaking or thin paint applied with stiff brushes to reveal either the canvas or underlying paintwork (below). 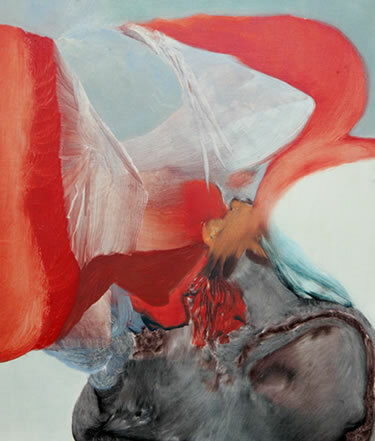 Planes and sworls of pigment are superimposed in ways which - despite an appearance of absolute overall spontaneity - would simply end up as a muddied mess of colour without careful wiping away, drying and repainting. 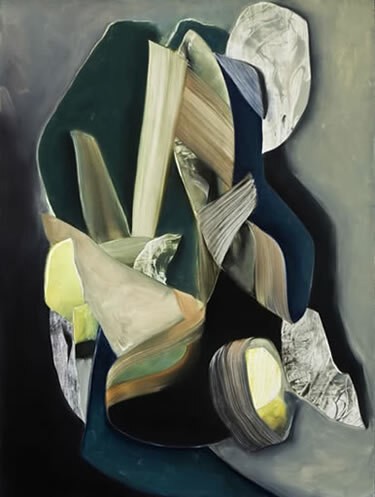 For Kerstin Brätsch, Photoshop not only provides visual referents in terms of its brush tools and filters (above), its layering system is also translated directly into her practice. 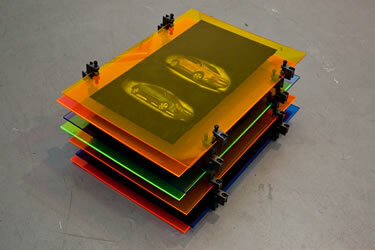 Works produced on sheets of paper or film are, like digital files, highly portable, with the ability to be temporarily exhibited, then rolled up and removed to new locations. 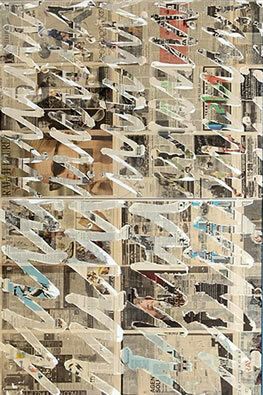 And in her most recent series of Interchangeable Paintings (left), three sheets of transparent Mylar, each featuring an individual painted motif, can be reconfigured to provide a wide number of alternative images. 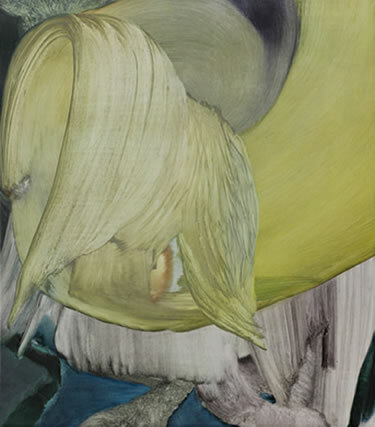 Brätsch's collaborative work with Adele Röder under the auspices of Das Institut allocates equally central - though less immediately apparent - roles to many other aspects of digital technology. 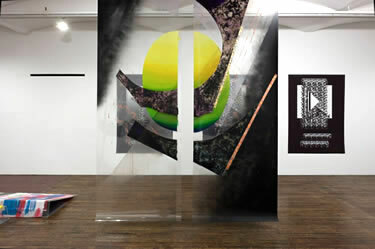 The computer serves as a principal communicative channel between the two artists, with Brätsch's paintings often reprising Röder's digitally prepared abstractions (left). Yet it also facilitates many of the other forms of output with which Das Institut, as a kind of ersatz creative agency, concerns itself. 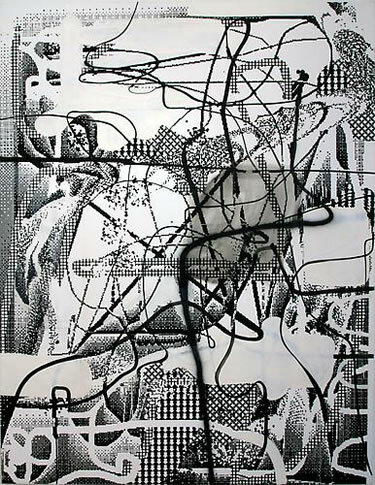 Textile designs may find themselves modified into posters or zines, for example, or motifs from paintings re-dispersed as stickers or packaging. In this respect, Das Institut's embrace of technology closely emulates the kind of digitally-enabled workflow undertaken by genuine marketing agencies. Nevertheless, it's important to note that Brätsch and Röder's cautious allegiance to the virtual workspace is far from absolute, with craft-based production (painting; knitting; hand-assembly) rigorously maintained and largely priveleged over purely digital output. Note 1. It's interesting to compare the working methods and concerns of Das Institut with Takashi Murakami's Kaikai Kiki Corporation. While ostensibly similar in their aim to expand possible channels of art production, the fully automated, factory-like ethos of methods such as Murakami's are not only regarded with a degree of cynicism by Röder and Brätsch, but ultimately rejected. As mentioned throughout this article, the accent among a new generation of painters seems to be on deployment of technology to facilitate and enhance traditional production methods, rather than effectively replace tem.